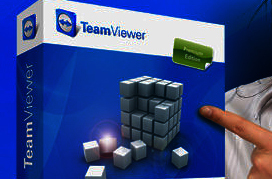 Our remote access support is done with the TeamViewer software. Q 0: The cameras are connected to the PC but the Control Panel states "No cameras detected"
A: The cause of this is most probably that the camera drivers haven't been installed or if they were, then the "USB Pro" option wasn't de-selected. 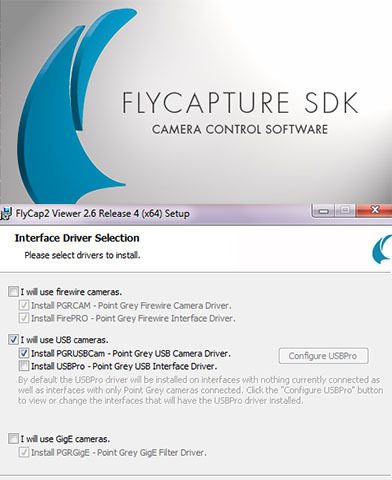 The above SDK installation program FlyCapture_2_4_3_11_x86 is located on the supplied DVD and must be started before any cameras are connected. Do not select the "USBPro" option ! the "Fixed Assigns" option in the Vcam window was set ON. To Fix: Switch the "Fixed Assigns" option OFF, exit and restart the CP. you can switch the "Fixed Assigns" back ON again so that they will always appear in the CP in the correct order. Q 1b: The cameras are connected to the PC but the CP states "No cameras detected"
Q 1c: The cameras are connected to the PC but the CP cameras window states "Camera not found"
1. Are the camera drivers installed? 2. Are the cameras detected in the "Cameras" window of the Control Panel (CP) ? 3. When you select the "Video Stream Mode" do you then see new images ? 4. 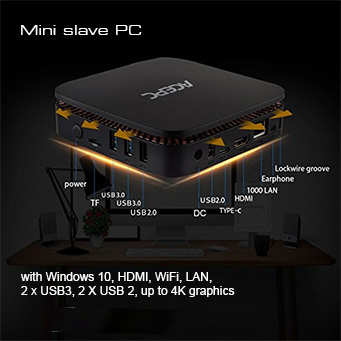 Are the cameras really connected to the PC via the USB cables? Note: there are two USB connectors on the back of the V, H , C cams. One is a mini B connector and the other a standard B connector. 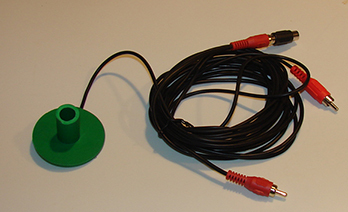 The smaller mini B connector is the camera data connector and must be connected to a USB port on the PC. The larger standard USB B connector is just for additional power and should be connected to a USB power adapter. 5. Are the USB cables to the cameras too long? To fix: use either powered USB hubs for every 10ft of USB cable or USB over Cat adapters. To test if it's the cable lengths causing the problem, connect each camera to the PC using just the supplied 6ft USB mini B cable. try connecting one of the supplied 9ft USB extension cables to the camera using a powered USB in between the 9ft cable and the 6ft cable. and a 9ft extension going from the USB hub to the PC. then a second powered USB hub will have to be added to the cable 6ft - to - 9ft USB connection. 6. Are the cameras connected to a separate internal hub and bus on the PC ? Connecting multiple cameras to ports that share one USB Host Controller will split the USB 2 480MBit/s speed. Power - in this case - will be shared to the cameras connected to it and this will cause the cameras to not function as each camera requires 2.0 watts to function. Q 2: What does "Camera Engine Start Error" mean? If you see this message displayed on the main window of the CP then communication with the camera has failed. i.e. trigger instructions can't be sent etc. If the message appears during play then it is usually due to the cable lengths being too long and the camera has insufficient power. Fix 1: Ensure that the cables connecting the camera to the PC has a powered USB hub at the halfway mark. i.e. if using 2 9ft usb cables for a total length of 18ft, then there should be a powered in the middle. 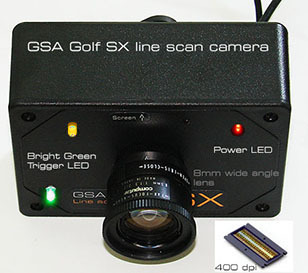 Note: all new GSA Golf cameras have an additional USB power plug on the back of the camera. 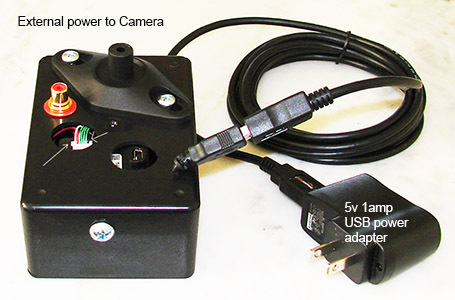 Contact us if your camera doesn't feature this power plug. If the message appears immediately when starting the CP and you have added new cameras, it is probably the fixed assignments causing it. Switch "Fixed Assigns OFF" in the Vcam window of the CP and restart the CP. Check that the camera functions assignments are correct (i.e. 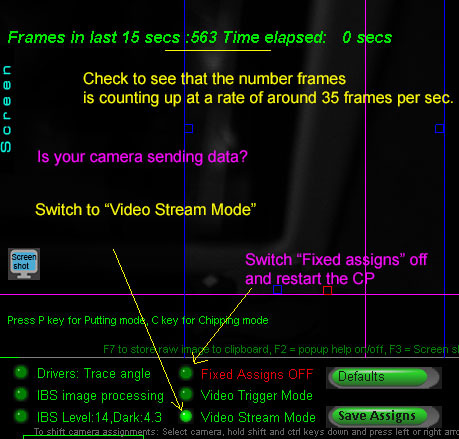 that camera 1 is the Vcam, camera 2 is the Hcam etc) and click the Save Assigns button and switch "Fixed Assigns" back ON. 1. Are the two RCA cables connected from the SX camera to the Vcam and Hcam cameras ? 2. When you turn the SX sensitivity dial on the remote control first all the way right (clockwise) and then left (anti clockwise), does the green LED light on the SX cam turn on? 3. Is the ceiling mounted IR LED lamp on? The LEDs in the lamp will glow a dark red when on. Note that there's a photocell on the LED lamps that automatically switch the lamp off when ambient light is in the room. Q 3 - 3: My cameras are connected and detected but no new images are captured when they are set to video mode. 1. The cable lengths are too long - Ensure that the cable has a single powered USB hub in the cable chain. 2. The cameraa has insufficient power. 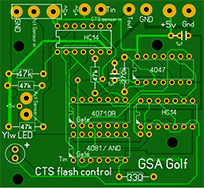 - Connect an additional USB power adpater to the camera. connect one camera to a USB port at the front of the PC and the other(s) to a port (or ports) on the back of the PC. A: This will occur when the SX camera's sensitivity is not set high enough or when the camera is mounted too high. To set the sensitivity, first turn the dial all the way right( clockwise) and slowly turn the dial left until the green light comes on and then turn very slowly back until the green light just goes off again. Ensure that the SX camera is not mounted too high. The max recommended mounting height is 9ft. Are you using a non or low reflective black carpet or turf under the SX camera? Click the above image to read more about trigger arrays. Q 5 : My cameras are all running but seem to be in the wrong order. select the camera in the CP cameras window, hold both the shift and ctrl keys down, and press the left or right arrow keys to move the camera up or down the sequence. 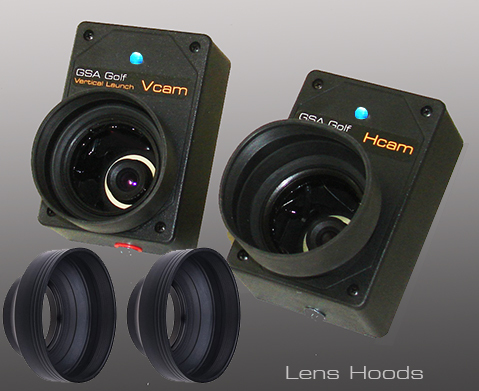 Q 7 : Why are my Vcam and/or Hcam images upside down or back-to-front ? 1. Is the SX Line scan camera triggering the V and H cameras and grabing new images when the cameras are in the default "Trigger" mode? To test, walk under the SX line scan camera ensuring that you see that the green LED goes ON as you stand under the camera. You should see that the V and H cameras capture new images (of yourself in this case). When you strike a ball you should see that the bright green LED lights up for a second or two. If not then click the above image go to the Line Scan camera setup page. 2. 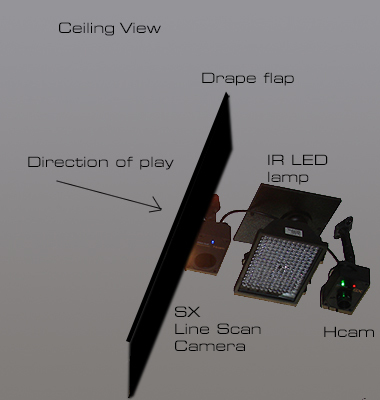 Ensure that the IR LED lamp mounted next to the SX camera is ON and pointing straight down. Note that the IR lamp has a photocell on the side of the case. This photocell will turn the IR lamp OFF if there's too much ambient light in the room (i.e. day light from an open window). If you don't see that the IR LEDs glow dark red then stick a piece of electrical - or similar - tape over the photocell. When ON, this feature will sound an audible beep everytime a trigger signal is sent from the line scan camera. This saves you from always having to look up at the SX camera to see if the green LED lights up when a ball is played. If using a trigger array, ensure that the green LED light on the trigger array is OFF and only lights up when a shadow is cast over the array. 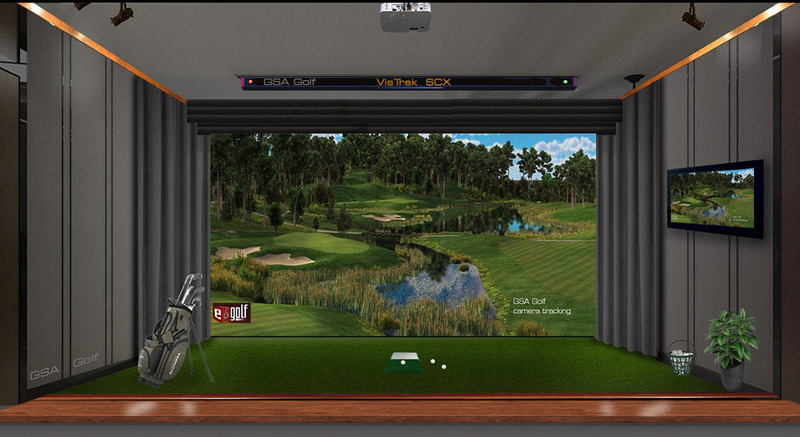 After a shot, the cameras are de-activated for a few seconds to prevent the following club or player from re-triggering the cameras. If you play a ball during this de-activation period then the cameras won't capture the ball and the ball won't launch in the software. 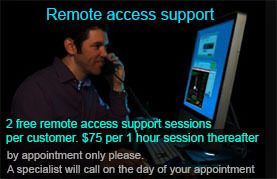 The de-activation time can be user set from 2 to 8 seconds. 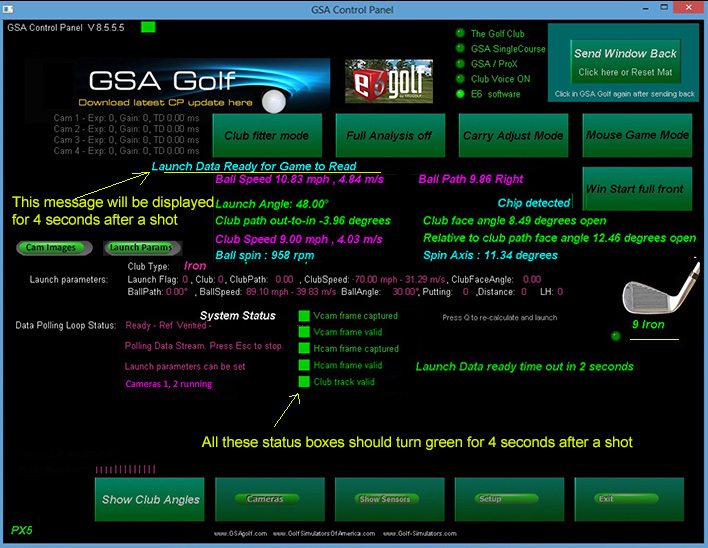 Using just the Control Panel (CP) , valid shot detection is displayed in the CP's main window with a text message displaying "Launch Dada Ready for Game to Read" as shown in the above image. This aqua colored text message will be displayed for around 4 seconds after a valid shot has been detected. In addition, all System Status indicators in the CP's main window will momentarily turn bright green as shown in the above image. If you see that any of these indicators do don't turn green after a shot then further investigation of the camera images is required to determine the cause. In the above Vcam shot image the background contains pixels brighter than the "Min Trace Gray Scale"
If cables are too long or there is an issue with the PC, a camera can go "off-line"
To check: go to all cameras in the Control Panel - one after the other - and click the "Video Stream Mode" button. You should see that the camera is sending new images at a rate of around 35 frames per second. 7. Are the IR LED lights actually ON ? You should see that the LEDs in the lamps glow a dark red if they are ON. If plugged in and you don't see the LEDs glow red, place a piece of black electrical tape over the photocell on the side of the lamp. It's possible that the cameras will function with longer cables for a while but connections may become unstable. To fix: use powered USB hubs for every 10ft of USB cable and power the cameras with external 5v power supplies. To fix: use powered USB hubs for every 9ft of USB cable or use CAT5 cables with a powered USB over CAT adapter. An alternative to running USB cables over long distances with powered USB hubs every 9ft, is to use Cat5 cables with a USB over Cat unit at either end and supply the camera with external 5v power. Connect two or all cameras to the PC directly with just the short 6ft USB cable to the PC. Check to see that both cameras grab new images when clicking the "Soft Trigger" button in both the V and H cam windows. 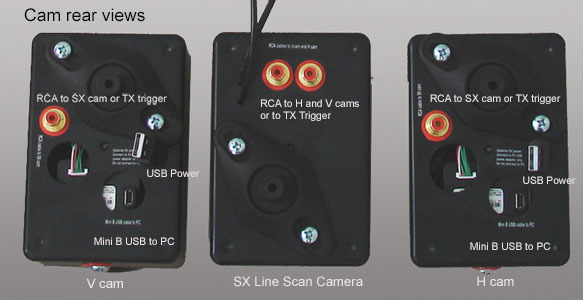 If not, then disconnect the RCA trigger cables from the SX line scan camera for the cameras and try again. If this works, then check the RCA cables from the line scan camera and check that the green light on the SX line scan camera goes ON when an object passes under this camera. If the green light on the SX camera is permanently ON or does not come ON at all then check the sensitivity of the SX line scan camera. If you find that all cameras trigger well with the short cables but not with the long cables then there is a cable issue. then this indicates that bot cameras are connected to ports sharing the just one USB channel. 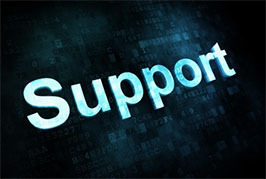 To fix: ensure that one camera is connected to a USB port on the back of the PC and the other to a port on the front of the PC. Usually the back USB ports on the back and the front of the PC run on separate USB channels. 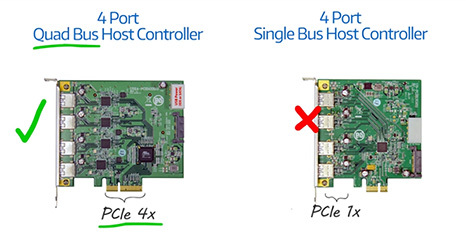 If this doesn't fix the problem or you are using more than two cameras then an extra USB card should be installed on the PC's mother board in either the X1 or X2 expansion slots. Q 11: How can I hit fades and draws with the CX2 system ? Q 12 : How can I hit fades and draws with the PX5 system ? 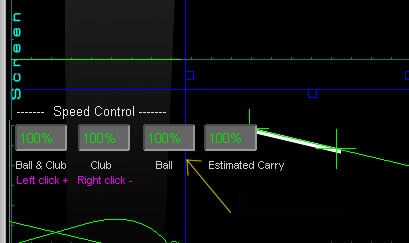 Ensure that after a shot that the system actually detected club data. Check the CP's main window for valid club data. 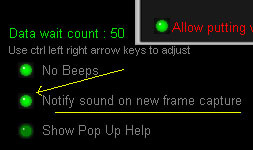 If not, then check that the "Valid swing loop count" in the "Sensor Settings" is set to 2 loops. 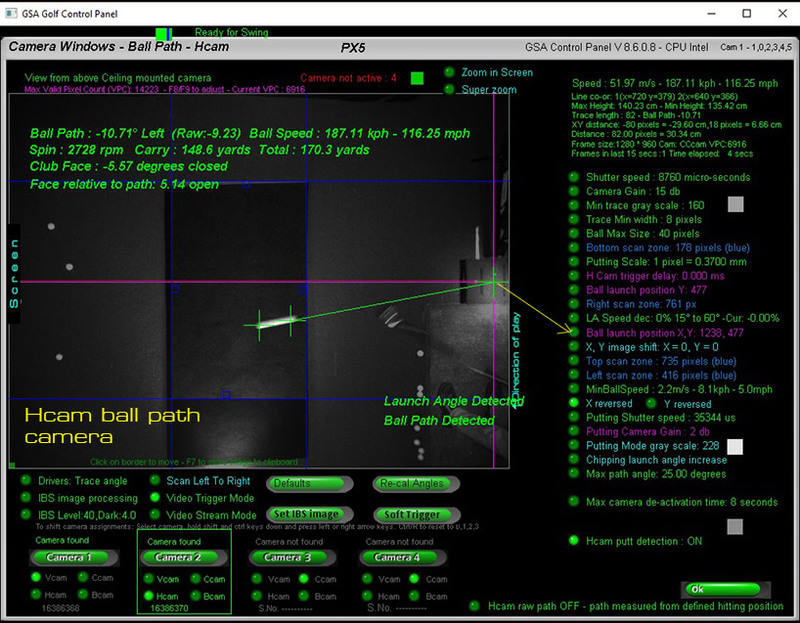 PX5 users may have noticed that with slow shots the club track data from the sensor mat is being used while with fast shots club data is being calculated from ball data and the real club data from the sensor mat is being ignored. This is now fixed in this version of the CP. i.e. the system will wait a second or so for the incoming data from the mat - which is slower to come in than data from the cameras. I'm not quite sure why this club face reduction code was put in the system some 10 or so years ago (probably to make the mat more forgiving) but it's removed now. Customer "Vincent" pointed this out and tests now show the issue is fixed. Q 13 : How can I use the SX line scan camera without using black carpet? 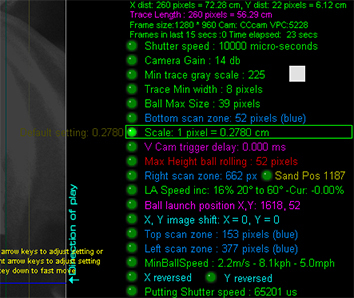 Q 14 : How can I increase the range left and right of the SX line scan camera ? Q 15 : How can I adjust the carry distances when they are not correct? 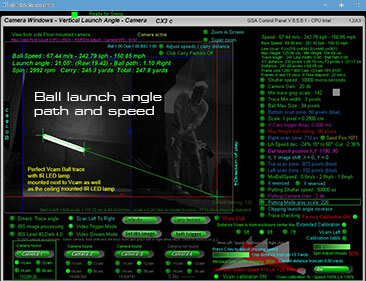 Ball speed - and thus carry - is calculated by the length of the ball trace in the Vcam. 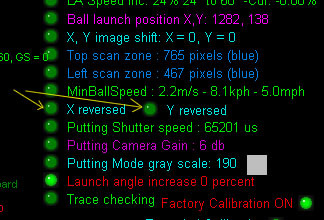 The speed of the ball is dependent on the distance the ball traveled within the camera time frame (shutter speed). The camera sees only pixels so a real distance-to-pixel scale factor must be used to calculate the real distance traveled. 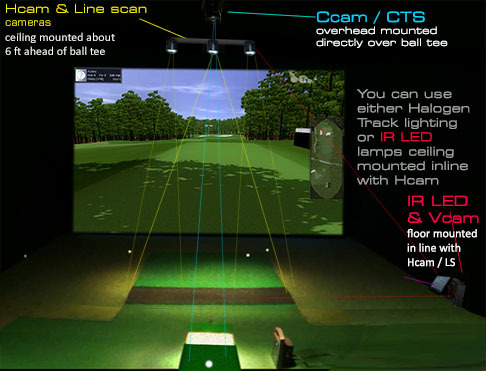 Thus, adjusting the Scale factor will alter the measured ball speed which in turn will adjust the distance/carry the ball will have in the golf simulation software. 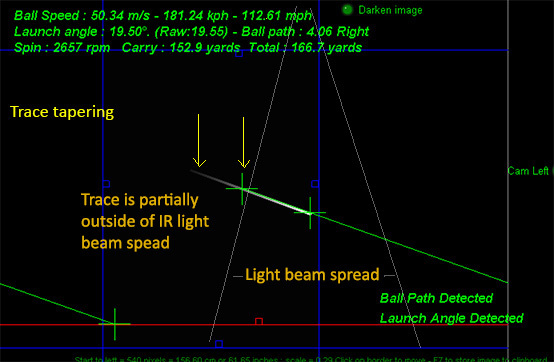 As measured ball speed is directly proportional to the length of the ball image trace , it's important that the ball trace from beginning to end is well illuminated. With really fast high speed shots, it is possible that the ball won't be sufficiently illuminated to leave a solid trace and appears to taper out towards the end. The image processing software in this case won't detect the full length of the trace and thus the measured ball speed will be too slow. 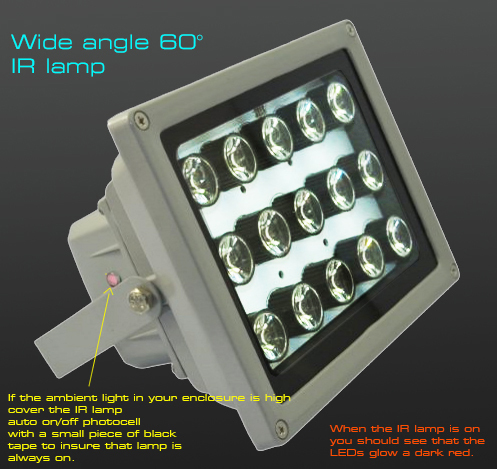 or additional illumination (either IR LED or Halogen) has to be added further ahead towards the screen. 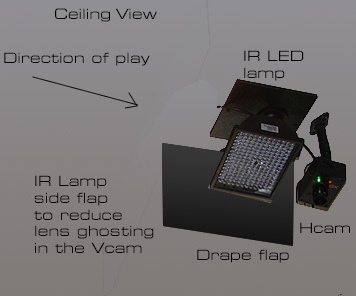 In addition, an IR LED lamp should be mounted next to the Vam so that the ball is also illuminated from the side. Vcam distances from the left line are 5ft, 6ft and 7ft. If your Vcam is over 7 ft away from the left line then just use 7ft setting for now. Click the above button to read how to calibrate the cameras yourself. are my short iron shots then too far ? are my woods and long iron shots then too short ? The "increase speed with increasing LA" method is used to fix carries that are too short for short irons but okay for long irons and woods. Note that this speed adjustment can also be reversed so that the measured ball speed will decrease with increasing launch angles. The "decrease speed with increasing LA" method is used to fix carries that are too long for short irons but okay for long irons and woods. The "LA Speed inc" text will then read "LA Speed dec"
Is the Club Carry Factors option set ON? 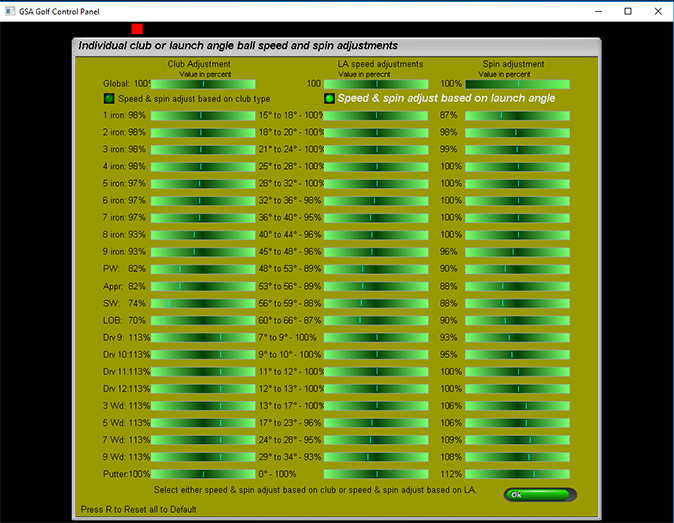 This table allows you to add speed / carry factors for each club or launch angle separately. Click the "Carry factors" button to open the carry facotrs table. There's a new slider bar in the Vcam window that allows users to adjust the LA based carry factors directly in the Vcam window and thus see the results of carry adjustment immediately. My shots are inconsistent. My carry distances are all over the place. 1. Is the complete length of the ball trace in the Vcam being detected? 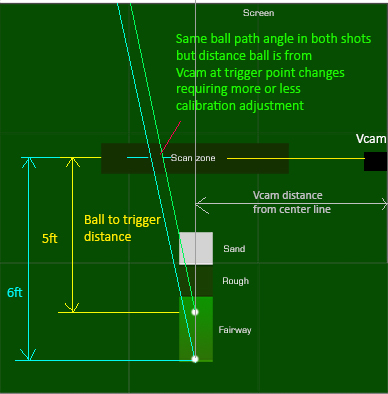 In order for the system to measure the correct ball speed, the complete length of the ball trace has to be detected in the Vcam. 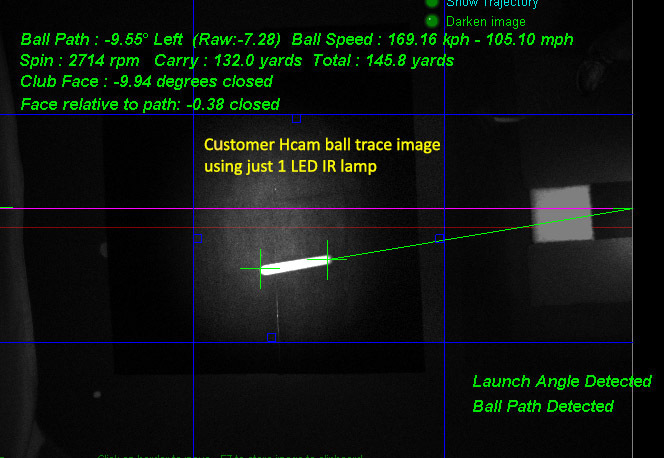 The above image shows a ball trace length that is only partially detected and thus a far lower ball speed is being measured. Fix: If you see that the trace appears to be fading out at the far end then add an additional IR LED light to additionall illuminated long traces. 2. Are "Carry Factors" switched on ? Check the factors if this feature is on. 3. Is "Factory Calibration" switched on ? and that it is ON if the Vcam is mounted on the left side of the enclosure. 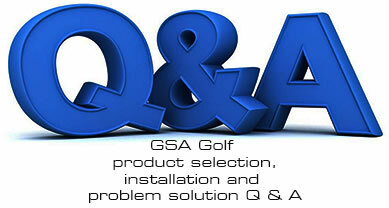 Q 17: How can I adjust the chip and putting distances when they are not correct? Q 18 : Why do balls hit left go further than balls hit right (or vice versa)? Also don't forget to set the distance your Vcam is from the enclosure left line. You must be using an older version of the Control Panel. If you have a CTS club track camera with trigger mat or a PX2 club track sensor mat (as with the PX5) then you can optionally setup the system so that it will only launch a ball if a swing (or any movement) over the mat is detected. You should see a new "Swing detected" message at the bottom right hand side of the CP's main window after a swing. This message appears for about 2 seconds. Shots will only be detected by the V and H cams during this 2 second window so you can walk freely around the enclosure without any inadvertent ball launches. 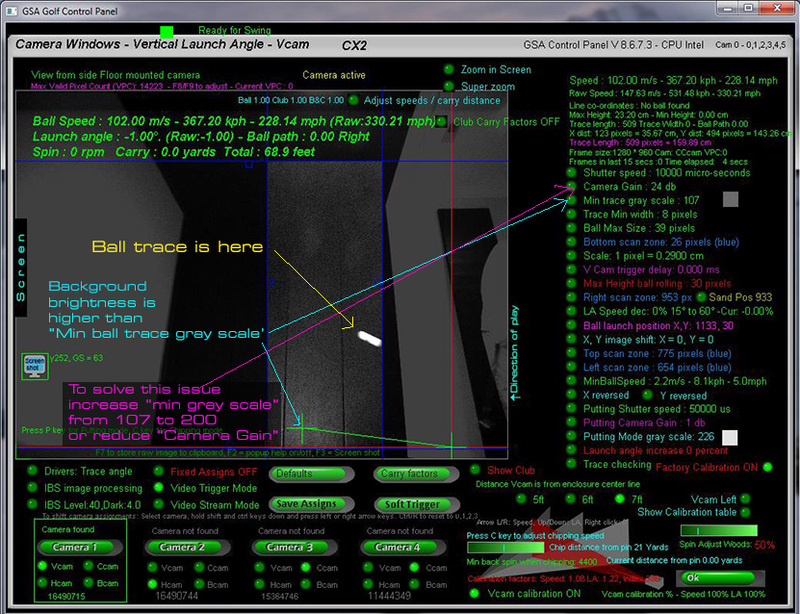 Switch the "No ball launch without swing being detected on mat" in the CP's Setup window. 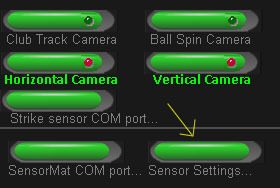 1. set the option "No ball launch without swing being detected on mat" ( this is now for both camera club tracking mats as well as optical sensor -px2 - mats. This simply means that if some kind of swing was detected on the club tracking mat ( it doesn't have to be valid, just that data or frames came in ) then - and only then - do we allow the shot to launch either with or without club data. 2. set the option "Allow putting without swing being detected"
When putting, the "No ball launch without swing being detected on mat" won't work because you won't be putting from the club tracking mat. 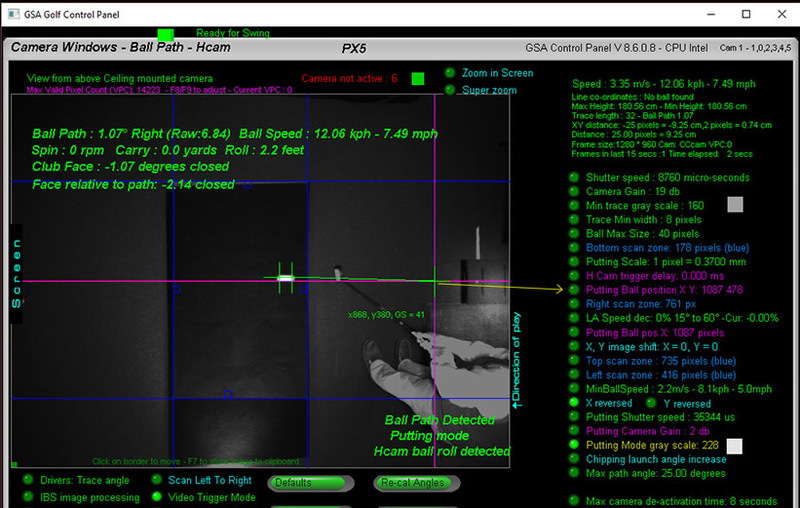 A putt is only recognized if the Hcam sees the ball but the Vcam doesn't as the Vcam's valid FOV is set to higher level than a rolling ball. 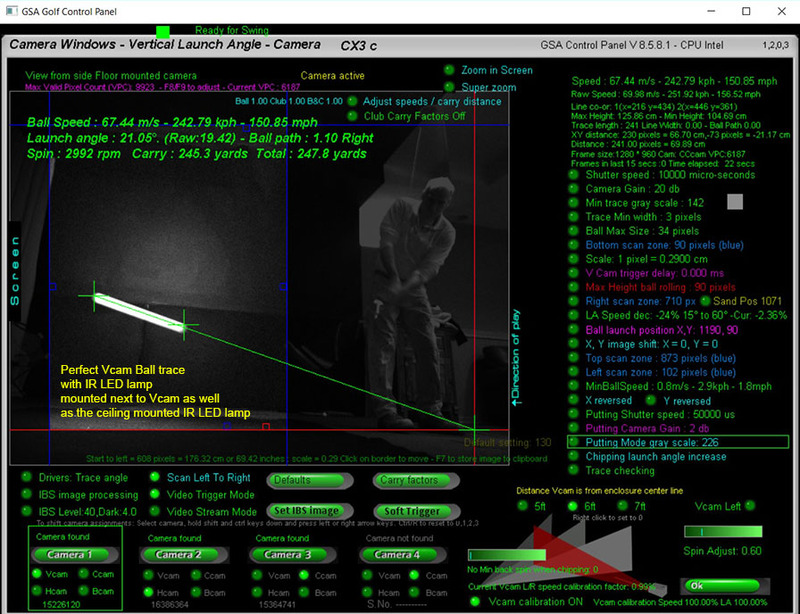 Thus, if the system is in putting mode or a putter has been selected and Vcam data has been captured, we don't launch the ball. i.e. if walking around the enclosure in order to retrieve balls you will certainly trigger both the H and V cams and in this case we dis-allow the launch. In addition to the above methods of preventing a launch when retrieving balls, the CP features a "Valid Pixel Count" known as VPC. The VPC counts the number of valid pixels - i.e. the number pixels in the Vcam that are equal to or are above the "Min Gray Scale" setting. Note that this method won't work if the player just reaches out with his club to retrieve a ball as club head can look like a small ball trace. 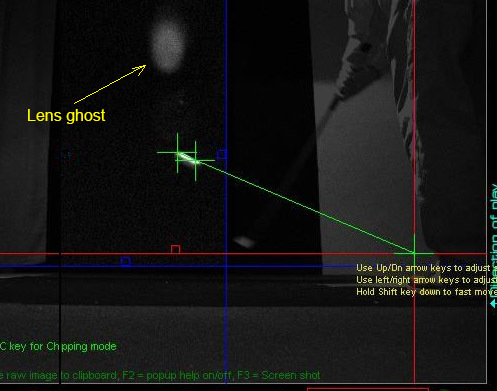 In this case, either the player shouldn't use a club to retrieve balls or the club tracking swing detection method should be used. To set the max VPC value, simply strike a number of balls and note the current VPC count displayed in the Vcam window after each shot. You'll probably find that - even with the longest shot - this value will be in the 2000 to 9000 value. In this case, set the max VPC count (using the F8 - to decrease and F9 keys - to increase) to the max value you've seen plus a tolerance of 500 of so. Occasionally inadvertent ball launches may occur when walking within the line scan area - usually to pick-up balls. The addition of this new line scan camera placed halfway between the Hcam and hitting area will prevent this. The "Line Scan Shot Detector" is used as a trigger gate that only allows the main line scan camera's trigger signal to pass through to the ball V and H cameras if an object passes through its FOV. It can also be used to detect if someone is standing at or close to the hitting position and thus blocks the main trigger signal if no one is at the hitting mat. A lower cost alternative to the line scan camera shot detection, is to use an optical sensor shot detector. This sensor is emedded in the hitting mat just in front of the ball launch position. Up to 3 sensors can be used: one in the hitting mat for regular shots, one on green surface for putting and one for the rough or sand shots. Q 23 : I don't have a disc drive on my PC. Can I download all the installation files? Dowload the full version and run it. 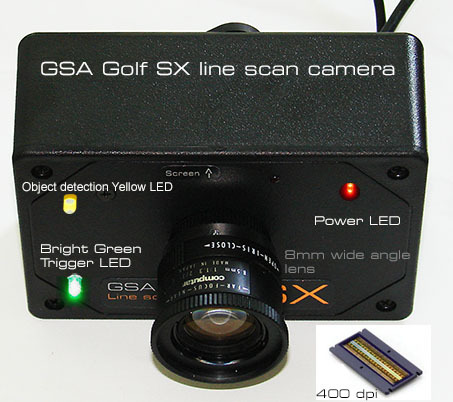 Create an account using the serial number of any GSA Golf camera you have. 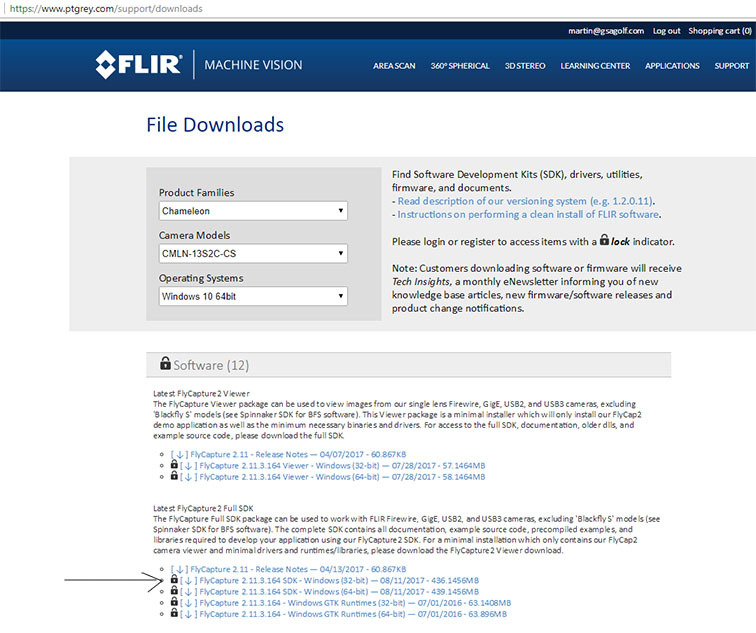 Download the 32 bit camera SDK and run it. Q 24 : Why are my ball traces appearing so faint ? 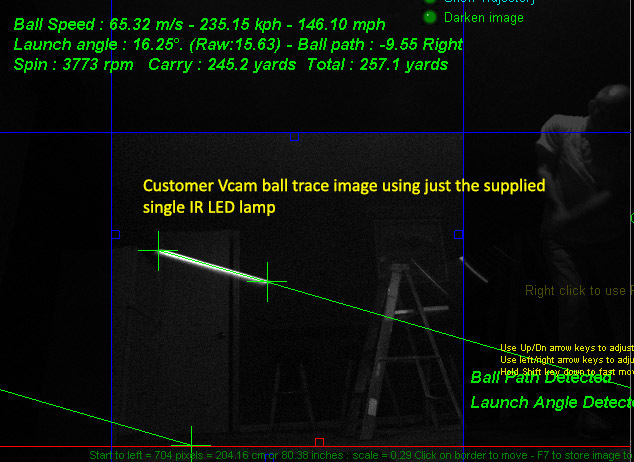 The Vcam ball trace brightness can be substantially increased by using high intensity narrow beam IR lamps next to the Vcam that are pointed at the trace capture area. There's a "Screen Shot" button on the left side of all the main screens in the Control Panel. This function takes a clear screen shot of the current window and automatically saves it to a jpeg file that can be sent to us via an e-mail attachment for us to analyze. A main reason for making this feature is that many customers are still sending blurred screen shots from photos made with their iPhones to us that are difficult to read. We put videos on the web site on how to make screen shots but still many find it easier to just take a photo. So now there's no excusues. Note the screen shot number shown in the message after taking a screen shot. Are you seeing light spots in the Vcam images on the back drop that aren't actually there on the back drop? 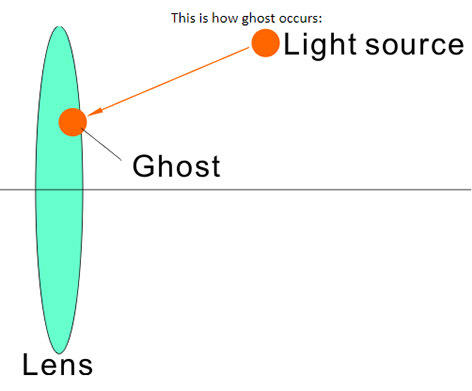 The phenomena is known as "Lens Ghosting" and is caused by light from the ceiling mount IR lamp hitting the IR filter at an angle greater than the lens angle. i.e. the IR light is outside the FOV of the camera so you don't see the light itself but its reflection is still there. Lens ghosting like this can cause havoc with the CP's image processing as it may well be picked up as part of the ball trace. 1. Place a hood on top of the Vcam camera case that extends some 4 to 5 inches out. We are now supplying hood cover flaps with new systems so contact us if you didn't receive them. In the meantime cut a piece of card 4" x 6" and tape it to the top of the Vcam. You can also attach a flap to the side of the Hcam to prevent light from the floor mounted camera. Attach it to the same side as the floor lamp so that it extends down 4 to 6 inches. 2. Tilt the Vcam camera further down. then use the new "Hcam launch" feature as described below. 3. Use a side flap next to the IR LED lamp. As it's possible that the ball trace with very high lofted shots will be out of the FOV of the Vcam camera, we've added a new feature that will allow the ball to launch with just the H cam data. Switch this feature on or off in the Hcam window (lower right side of screen). 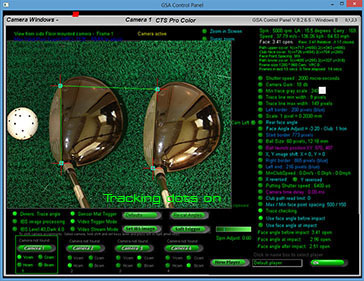 When ON and a valid shot is detected in the Hcam but no valid trace is detected in the Vcam, the speed and direction of the of the ball will be measured just from the Hcam. Vertical launch angle will be taken from the loft of the selected club. The new stereoscopic software - which will soon be available - requires that both H and V cam cameras are ceiling mounted and point straight down. This configuration eliminates any danger of lens ghosting as all lighting will also be ceiling mounted and thus both cameras are pointing away from the lighting. Q 28 : There is a lag time between me striking the ball and it launching in the game software. How can I fix this? Usually the V and H cams will capture the ball before club data coming over slower lines arrives at the CP. the system will wait a while for the club and or spin data to arrive. The wait counter is set to this value when both the V and H cams detect a shot. If this number counts down to 0 then the shot will be launched with just the ball data from the V and H cams. If you notice a significant delay between striking the ball and the ball launching in the game, reduce this wait count value in the Setup window of the CP to around 10. Q 29 : With fast shots that have long ball traces, the trace extends into the screen area and thus the correct ball speed can't be measured. 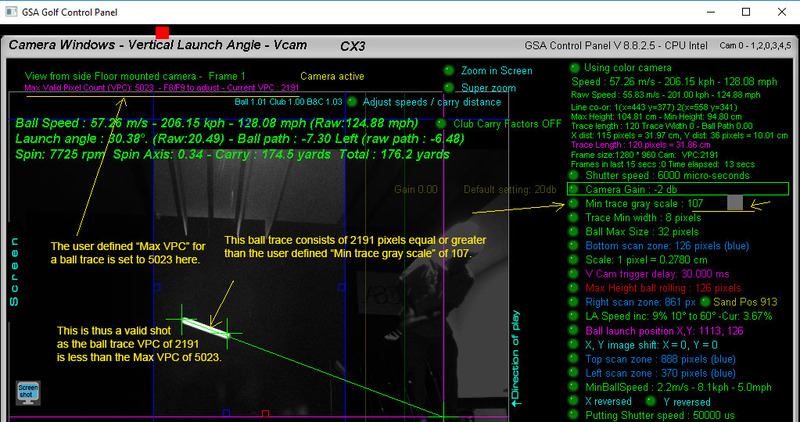 In order to measure the correct ball speed, the full length of the trace must be detected in the Vcam. 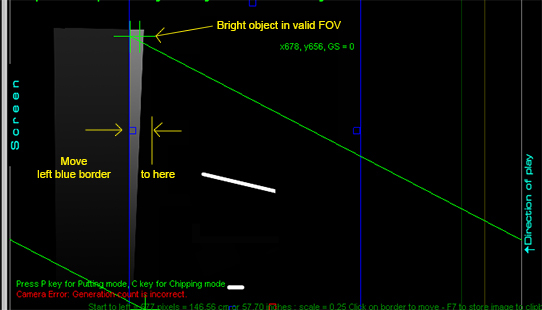 The trace should therefore be centered in the valid FOV of the camera. To do this, simply move the Vcam further towards the screen of rotate it further towards the screen. 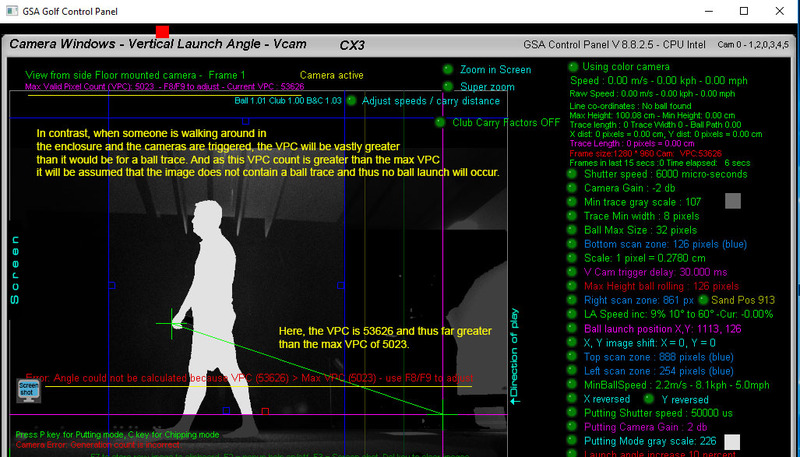 The CTS flash is being picked by the SX line scan camera and preventing the V and H cams from detecting a ball launch. If less than this then the flash will probably prematurely activate the SX cameras which - in turn - trigger the V and H cams and thus miss the ball. from high flying balls and helps prevent ambient light or CTS flashes from getting into the SX line scan camera. A drape flap mounted in front of the CTS unit will also help to block the flash light from being picked by the SX line scan camera. "No COM Port IO" and "Sensor mat not detected"
Click the above image to read more about the the "Serial Enumerator"
but the screen keeps flashing "Reset ON, No light over sensor mat"
A: Light is not getting down to one or all of the 3 reset sensor at the back of the mat. Ensure that the overhead halogen lamp is pointing directly down and over the mat. Ensure that light is actually getting down on to the 3 reset sensors and nothing in the 3 holes is obstructing the light. Either move the light back or the mat forward so that the overhead halogen light is directly over the 3 reset sensors at the back of the mat. A: Usually this only occurs if the ball is not being played from the tee holder position on the sensor mat. When playing the ball from behind the tee holder, the ball will trigger the club face angle sensors instead of the club and thus erratic club face angles will be detected. 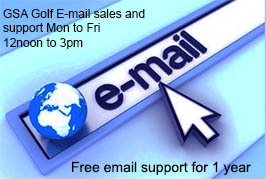 Other reasons are: woods and drivers have rounded faces and thus the club face angle cannot always accurately detected . Unfortunately this is an inherent problem with all optical sensor club tracking mats, no matter from what manufacturer. Another possible cause can be the lie angle of the club at impact being too steep and thus letting light get under the club so that the sensors are being triggered unequally. Other than replacing the sensor mat with a camera based club tracking system, there's no absolute fix for the problem. However, these last two causes can be greatly lessened by setting the max measured club face angle to a lower value - like 11 degrees as in the above image. 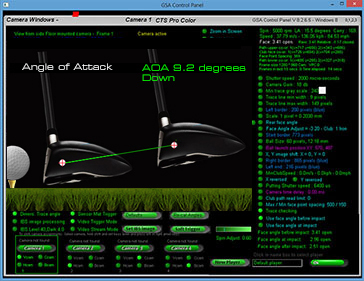 or selecting one of the "Club face easy" options in the CP's Setup window. When putting, the ball flies over the green for 50 yards and more. This is most likely due to the "Chip ball speed adjust" setting being too low. We've introduced a new "Chipping Mode" feature that allows you to set a ball speed adjust factor, minimum spin rate and a launch angle adjust factor when chipping. Chipping mode automatically kicks in when the ball is within the User Defined chipping mode distance from the pin but not on the green. 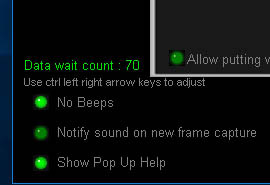 For tests purposes you can manually set to "Chipping Mode" by pressing the "C" key on your keyboard. Note that switching the "Chipping Mode" on or off with the "C" key is only possible if a game is not in play. Holding the keyboard "Shift key" down converts the "Min ball spin rate" slider bar into a chipping ball speed adjust factor. 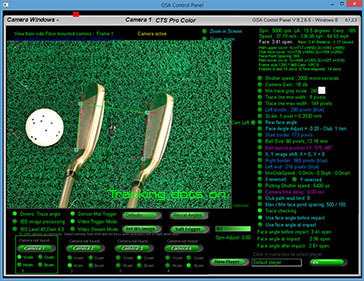 The above screen shot shows that the measured ball speed of the chip has been reduced by 65% and that the chip distance has been set to 54 yards.